Ever feel like you are living your life running on a great, big, giant, hamster wheel? It’s easy for days to just blend together feeling like you will never catch up. In fact, if you think about it too much, it just seems overwhelming. But what about your dreams? The things that light you up inside? Will there ever be enough time for them? Or are they sitting in a corner somewhere completely neglected? Your life is full of demands. It can be a survival skill to stop paying attention to how you think, what you dream, or the way you feel just to be able to perform. The problem is that when we stop paying attention to our dreams, it results in a life lived on autopilot. I get this because I’ve lived it. I have a career and a family. I was really trying to eat well and work out. And most of the time, I was completely exhausted. I always felt like the worst mom ever because I could never remember which date I was supposed to send cookies. Or when that recital was. Or OMG what do you mean there is a field trip today and I forgot to pack a lunch and send that permission slip???!! My desk at work was a deluge of sticky notes. All the deadlines blended together in my head–whether big or small. Getting everyone fed was as important as delivering on that big proposal deadline. And forget about weekends being fun, that’s when I was catching up on the house stuff, or planning meals, or buying someone shoes because they suddenly stopped fitting. I never got to play. Or spend time on the things that mattered most to me. I was beyond burnt out. And I had no idea what to do about it. As part of my day job, I went to a conference. It was one of those business book conferences where the latest authors were presenting their big ideas. My brain was full of information, and I walked out at the break feeling submerged. The technique I saw that day is called a lot of different things. I’ve heard the terms: scribing, sketchnotes, graphic recording, infodoodling, and visual journaling. (There’s probably more.) You may have seen videos where a hand sketches the ideas for a talk as the speaker is speaking. I grabbed a cheap notebook, a pen and some crayons. Eventually, I had my notebook with me all the time and started using it for everything. Conversations, task lists, ideas, plans, things I wanted to remember… One of the most effective uses was just dumping thoughts like popcorn onto the paper whenever I was feeling overwhelmed. Later, I came across Ryder Carroll’s work, and I added an index and adopted his Bullet Journal method of rapid logging and migrating tasks. Visual journaling took me from overwhelmed to organized. Not only that, but it shook the dust off my dreams and started to make them happen. And without even realizing it, this practice changed everything. Why this blog exists and how it can help you go from overwhelm to intention. Journaling is a powerful tool for living life with intention. When we capture and review what matters most to us, it breaks us free of the hamster wheel. It is the visual component that makes the difference. Color and simple drawings when done by hand, engage our brains in a different way than typing or simply writing notes. The part of us that dreams and imagines is visual and in color. Getting that out of our head and in front of our eyes, makes a huge difference in the type of life we get to live. The best part is that anyone can do this. 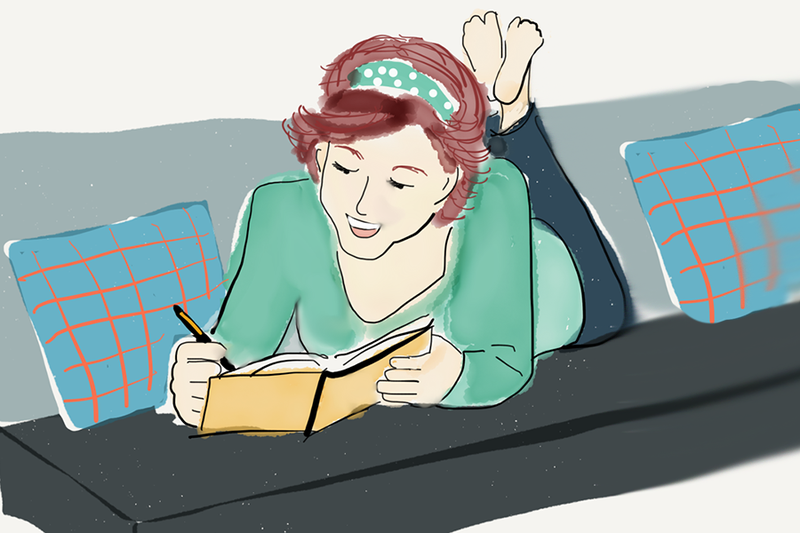 You don’t have to be an artist to practice visual journaling. I definitely wasn’t when I started. Simple drawing was our very first written language. If you can write the letter M or Q, you have all the skill you need. Sometimes I’m still blown away that such a simple practice could produce such incredible results. I love my life. I feel great. And I’m living in integrity with who I am in my heart because this practice took me off of autopilot. It isn’t even just about getting organized. This practice has helped me clarify what I want, and then: make it happen. It’s helped me eliminate the non-essential, and maximize the things I love! It’s how I was able to create this blog while still enjoying a career and family. Visual journaling is powerful, but the technique is easy. YourVisualJournal.com is the place where I share how to create your own visual journaling practice. This is not a site for spending hours on Pinterest-worthy layouts. This is about visually journaling in real life, for real people, with real daily demands. Sign up to get inspiration delivered to your inbox and get the free QuickStart guide. What’s in those pages can get you started journaling visually today. Click here to sign up and download the guide.